Nothing says summer more than an armload of cheerful zinnias. 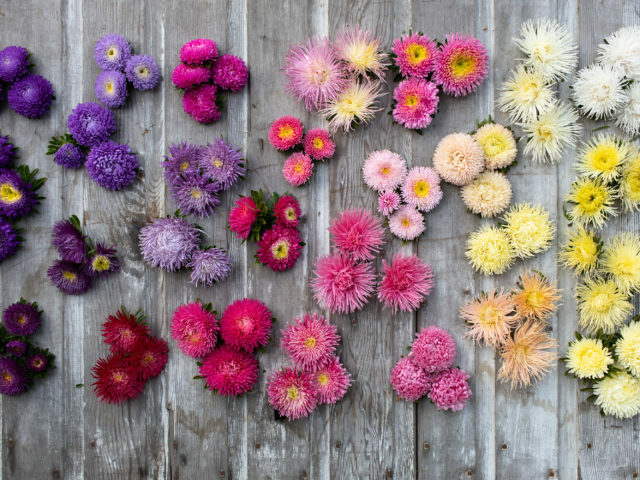 Available in a brilliant rainbow of colors, these happy blooms are a must grow for any flower lover. 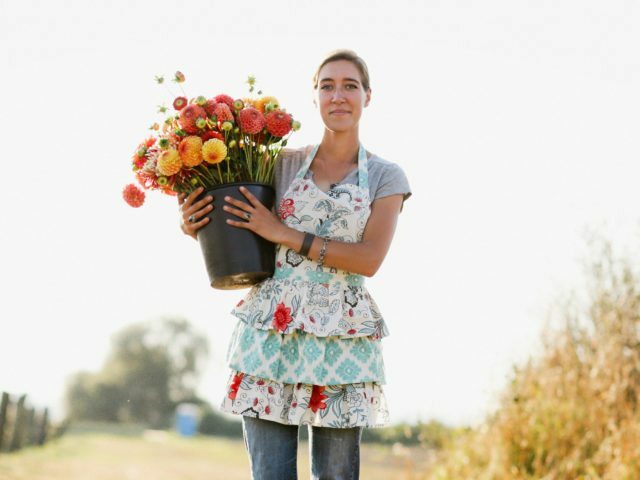 As one of the easiest cut flowers to cultivate, they are a perfect first crop for beginning growers and are reliable, prolific producers for most flower farms. We’ve been growing zinnias since the beginning and every year I fall more and more in love with them. Zinnias resent cold weather and prefer to be planted after things have warmed up a bit. 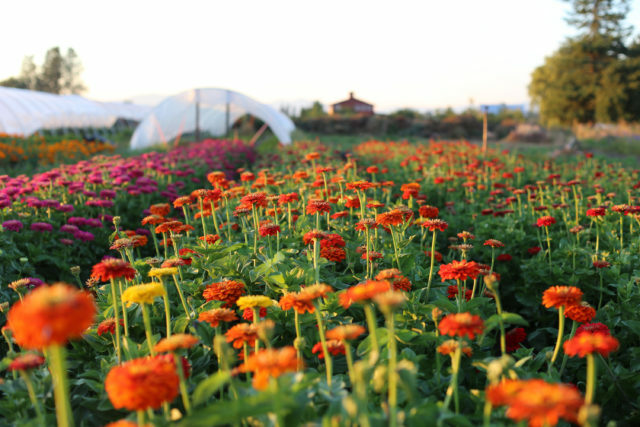 Many gardeners in warmer parts of the world are able to successfully direct seed their zinnias straight into the field, but here in cool Washington we start our plants in 72 cell trays in the greenhouse 4-6 weeks before our last spring frost. Plants are tucked into the field around mid-May, once the weather has sufficiently warmed up and all danger of frost has passed. 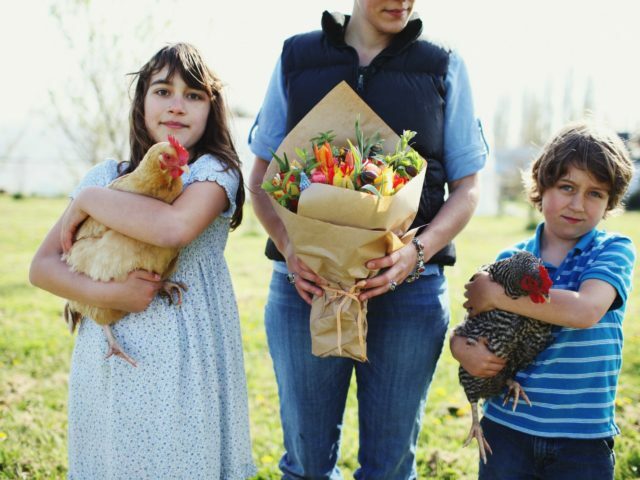 Like every flower grown on our farm, we try to give them the best start possible. Learn more about soil preparation here. Once the planting beds have been prepared, we lay down four lines of drip irrigation, roughly a foot apart and then the beds are covered with a layer of pre-burned landscape fabric to control weeds. Plants are spaced 9×9 inches apart with five rows per bed. If given good soil and a steady supply of water, plants can get huge and require some type of support. We use a layer of Hortonova netting stretched horizontally about 12 inches above the ground. Netting is held by in place by metal hoops that we made with our Johnny’s Quick Hoops Bender. Any type of stake, wooden or metal, will work just fine. As the plants grow, they push up through the grid of netting and get the support they need. Zinnias like the heat and it’s important that they are grown in full sun. In addition to choosing a sunny spot, I always grow them in fabric for the added heat. When we first started growing zinnias this closely together I was worried that they would be plagued by disease, but since they are grown in such rich soil, this hasn’t been a problem. 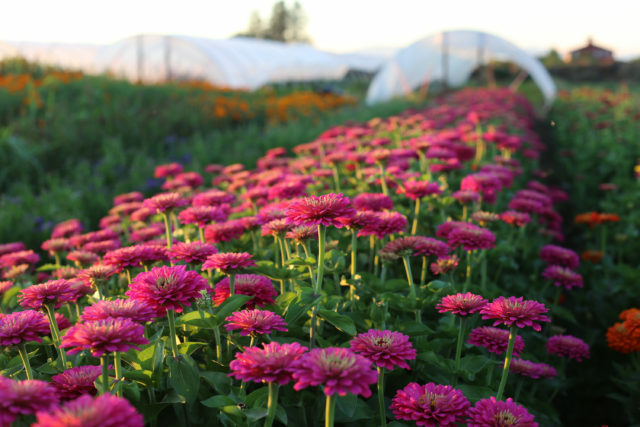 We succession sow zinnias every 2-3 weeks in order to have a steady stream of these beautiful blooms all summer long. The secret to getting the longest stems from your zinnias is pinching them when they are young. 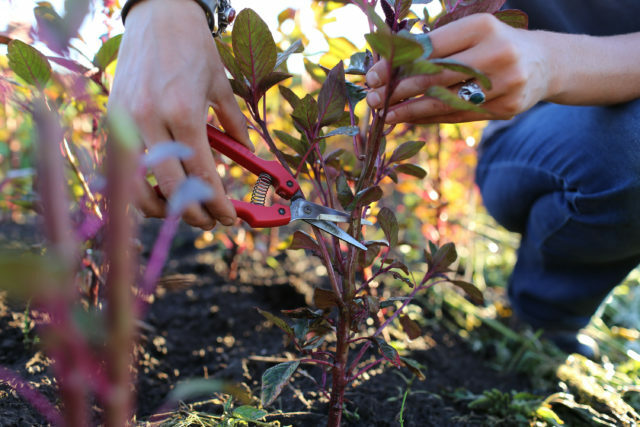 Here’s how it’s done: When plants are between 8 to 12 inches tall, take sharp pruners and snip the top 3 to 4 inches off of the plant, just above a set of leaves. This signals the plant to send up multiple stems from below where the cut was made, resulting in more abundant flower production as well as longer stem length. The photo above demonstrates pinching with another type of plant. If you are not regularly harvesting your zinnias, be sure to deadhead any spent blooms to help focus the plant’s energy into producing new flowers and not going to seed. Zinnias need to be picked when they are fully ripe, otherwise they won’t last in the vase. 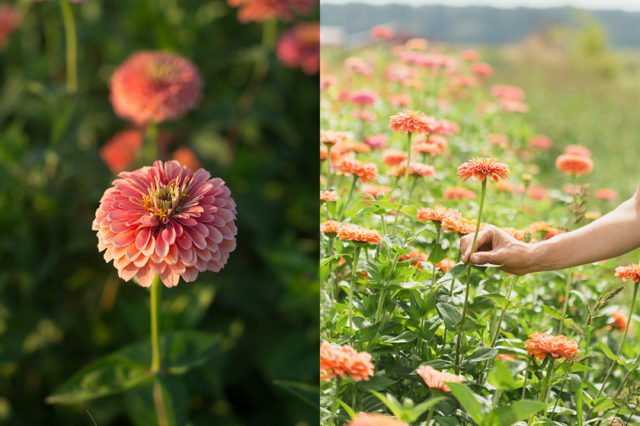 To tell whether a zinnia is ready to harvest use the “wiggle test.” Simply grab the stem about 8 inches down from the flower head and gently shake it. If the stem is droopy or bends, it is not ready to cut. If the stem is stiff and remains erect, it is ready to harvest. Zinnias are considered a “dirty flower” and benefit from a drop of two of bleach in their water. Do not put them in the cooler since the flowers are very cold sensitive. There are an unbelievable number of zinnias to choose from in every shape, color and size imaginable. Depending on what your needs are, there is definitely a zinnia for you. 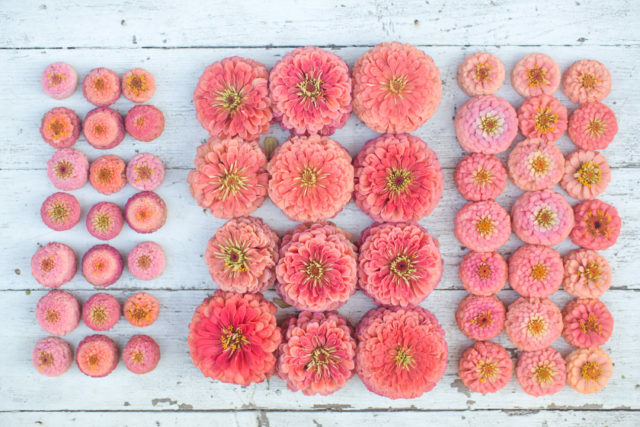 For example, if you’re looking for flowers in the peach-salmon range, look at just how many choices there are! Top row, left to right: Giant Salmon Rose, Zinderella Peach, Queen Lime Orange. Bottom row, left to right: Señora, Lilliput Salmon, Oklahoma Salmon. Here’s a great example of the different size options available in one color. Left to right, above: Lilliput Salmon, Giant Salmon Rose, Oklahoma Salmon. Left to right, below: Giant Salmon Rose, Oklahoma Salmon, Lilliput Salmon. I thought I’d share some of my favorite varieties that we grow here on the farm in hopes that it inspires you to plant some of these hardworking, heat loving beauties in your garden this season. Benary’s Giant Series: The largest flowered varieties in the zinnia family, plants often reach 4-5 feet tall and have a high percentage of huge double flowers. They come in a wide range of colors (12 in total) and are known for their strong stems and good disease resistance. My all time favorite variety is Giant Salmon Rose (pictured above) because its warm peachy color is so versatile and softens with age. It pairs well with both pastel and vibrant colors. I also love the Desert Sunset Mix (pictured above) which includes my favorite warm toned Benary’s Giant colors: Coral, Orange and Carmine. They make a bold statement when combined with acid green or deep maroon flowers and foliage. If you’re looking for individual colors, Johnny’s Selected Seeds carries the full range. Oklahoma Series: These are hands down, the most productive and floriferous zinnias I’ve ever grown. The series boasts 7 colors including Oklahoma Salmon, Pink, Carmine, Ivory, White, Yellow and Scarlet. Ivory was recently discontinued but we are working on building up our stock seed to hopefully reintroduce it in the near future. Salmon (pictured above) has petite, double blooms that are a warm mix of salmon and peach and combine well with anything. Everyone loves this treasure! 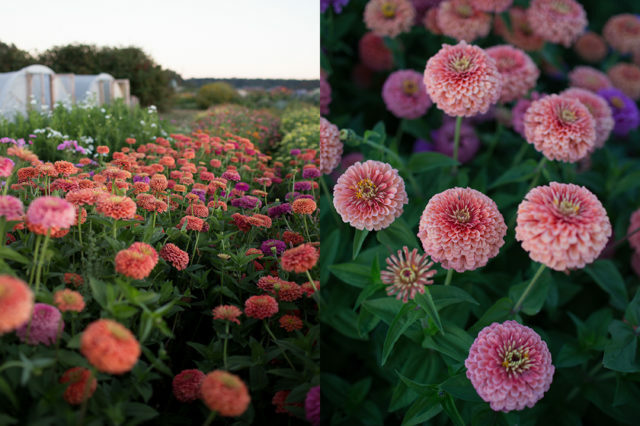 Queen Series: Unlike other zinnias, this series includes the most unique array of unusual coloring including lime green, smokey apricot, dusty rose and limey blush. 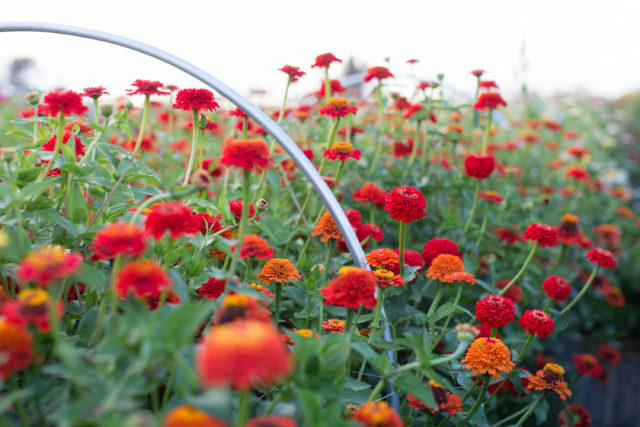 In addition to their special coloring, the Queen Series also produces vigorous plants with sturdy stems and tough flowers, a welcomed improvement to the zinnia family. These gorgeous novelties are sought out by designers for their unique coloring. The mostly double and semi double flowers of Queen Lime Blush (pictured above) are a stunning blend of green and purple, unlike anything we’ve seen. Everyone who sees them instantly falls in love. It’s a must grow! Queen Lime Orange: This exciting new addition to the Queen Series is the most beautiful range of iridescent raspberry, apricot and smokey-peach with a dark cranberry center. This versatile color looks incredible when combined with rich foliage and blooms. Scabiosa Flowered types: I grew scabiosa flowered zinnias for the first time in 2014 and they quickly became one of my favorite crops of the season. The frilly double blooms look like mini gerbera daisies or double flowered echinacea. They have nice long stems, good disease resistance and come in a beautiful range of colors. Candy Mix (pictured above) is an improved mix that contains a higher percentage of double flowers in a warm, cheerful blend of scarlet, raspberry, rose, salmon, tangerine, gold and cream. One thing to note is that many growers in warmer climates have noticed that they don’t get the same high percentage of double “scabiosa types” (pictured right) that we do here in the Northwest. After a lot of research and emails back and forth with the breeders, it seems that if plants undergo any stress, including not getting enough water or too high of temps, they will start producing single flowers (pictured left). While the single blooms are pretty and unique, many folks have been disappointed by this fact. 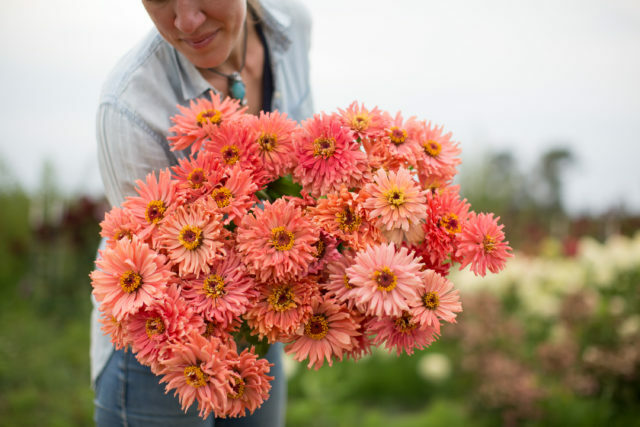 Zinderella Peach has frilly double blooms that are a warm mix of salmon, peach and cream, accented by a striking dark center. Of all the zinnias we grow, this might be my favorite. Zinderella Lilac (pictured above) is a lovely mix of blush and soft lavender, accented by a striking dark center. It’s ideal for wedding work and floral designers love it! Bicolor Novelties: These unique bi-color novelties are sure to catch the attention of everyone who sees them. We’ve been growing Macarenia for years and have found that people either love it or hate it. Each glowing scarlet petal is tipped in gold for a fun twist. Winner of the Fleuroselect Novelty Award in 2012, this hardworking plant thrives in heat and is very easy to grow. 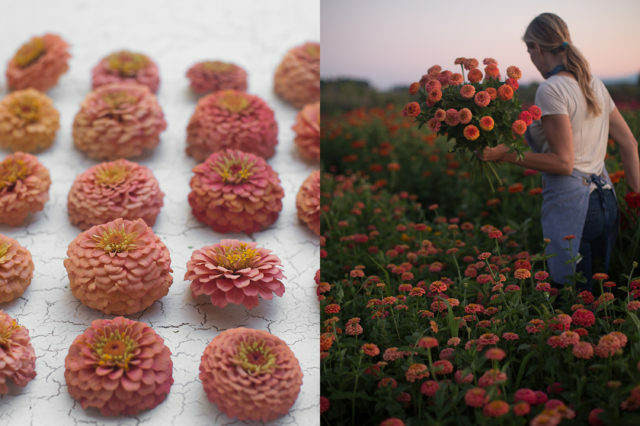 Mazurkia brings a new twist to zinnias and is a Fleuroselect Winner for good reason. The mid-sized plant produces fun, campy double flowers with lipstick pink centers and soft blush tips. Miniature flowered types: The old fashioned Lilliput Mix (pictured above) deserves a spot in every cutting garden. The easy to grow, heat loving plants produce a bumper crop of sweet blooms on long, strong stems in shades of rose, carmine, orange, coral, white, yellow and violet. Their petite flower size makes them ideal for flower arranging. I especially love Lilliput Salmon (pictured growing above). This adorable bloomer produces an abundance of petite, fully double, dome-shaped salmon flowers all summer long. The Sunbow Series, available from Johnny’s Selected Seeds has been around for ages and has miniature 1-2” double blooms that ride atop long, sturdy stems. It comes in a cheery mix including: rose, purple, golden yellow, scarlet, orange, pink and white. Plants have long, wiry stems that make them well suited for flower arranging. Cactus flowered types: These fun novelties have the coolest twisted, shaggy petals and come in a wide range of colors including orange, pink, red, yellow, peach and white. My favorite is Señora (pictured above) which has warm salmon-apricot, quilled blooms and produces a bumper crop of large flowers that have long, strong stems. It’s a must grow! 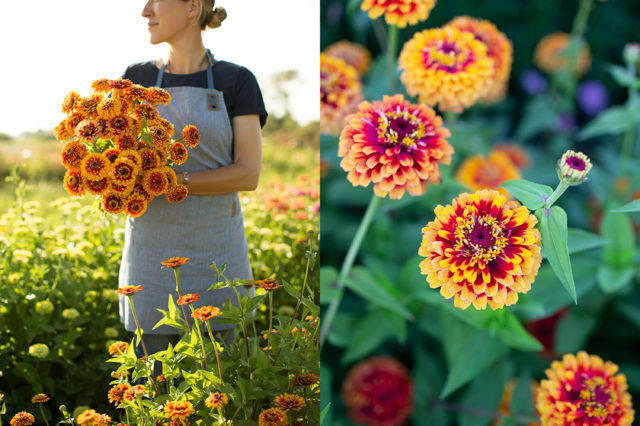 Mexican Zinnias: While plants themselves are compact, they churn out an abundant amount of stems for cutting from midsummer to early autumn. Their petite stature resemble more of a bedding plant than a cropping variety but I think they are deserving of a spot in every cutting garden. The Persian Carpet Mix (pictured above) includes adorable gold, cranberry, orange and cream flowers. The brilliant, eye-catching Aztec Sunset mix includes a wide range of miniature bi-color blooms in shades of buttercream, gold, cranberry, rust and merlot. These reliable bloomers are a great addition to the cutting garden and front of the flower border. I would love to hear your experience with this wonderful group of plants. Do you grow zinnias or plan to add them to your garden this coming season? If so, what are your favorite varieties, or what new treasures are you adding to your wishlist? Please note: If you submit a comment and it doesn’t show up right away, sit tight, we have a spam filter that requires we approve most comments before they are published. Lastly, if you feel like this information is helpful, I would love it if you would share it with your friends. This is so helpful! I have gardened all of my life, but I have always focused on vegetables and companion flowers like marigolds and nasturtiums. I’ve never grown zinnias before, but I just started a flat of the Queen Series today. I’m excited to see how they do in my garden this year. Thank you for taking the time to put all of this information together to help aspiring flower growers like myself. It truly is appreciated. I’ve heard of a ‘dirty’ gardener, but never a ‘dirty’ flower- I can’t even ‘google’ it! I love Zinnias! Where I live in central CA it is incredibly hot months on end and they are one of my favorite in the garden, and I must plant more this year! Thank you so much for all the wonderful information and photos that you provide I really appreciate it! Absolutely beautiful! Thank you for your tips on these. They are one of my favorites. Love, love, love the amazing flower growing wisdom you impart. It seems you are sold out on most of the zinnia varieties I would like. Can you offer an alternative source? Can you please share your source for these varieties. I only have what is offered at the big box stores in my area. hi, I’m stating this year to be a flower farmer! So excited! I live in Cincinnati Ohio. Actually, in a small rural town outside of Miami University. We are starting small with a 1/2 an acre and building from there. Where would you recommend we purchase the zinnias from? They are my favorite. If you had to advise us on 5 to plant, which five would you suggest? Any other advise would be great. We are really reading up on all of it. I just love your flowers! It inspires me. We are going to prepare our soil and I think we are going to plant seeds unless you think otherwise. What about water? How do you get water to your flowers? I grow cut flowers to decorate my church. We always hope bouquets last a full week there. The longest lastin bouquets ever are zinnias with statice, can maybe go two weeks! They are so carefree in our east Texas sandy loam that I use Zinnias as row markers in the orchard. Just scattering a handful of seeds adds a splash of color to the end caps or paint the orchard with dabs of color beneath the olive trees. It is a joy to see the pollinators flitting between Zinnia islands. Love all the variety and pics! Thanks for sharing! I’m considering starting zombie from seed instead of direct sowing. Would they do well in a sunny window sill, or do I need to use grow lights? Do you recommend a heat mat? Thanks! Zinnias are so easy you can direct sow them, or start them inside under lights or in a southern facing window. In a window they can tend to get leggy, but if you plant them outside fairly quickly, or take them out to get sunshine during the day, they should do really well for you. I’m in New Zealand on the east coast of the North Island. Its a temperate climate with hot dry summers. Zinnas are a favourite to grow in bulk in my gardens but unfortunately the fabulous range shown aren’t so available here. Shame! I’m in one of the milder parts of Montana (Zone 3+ or 4-), but I’ve struggled starting them in the greenhouse and had the best luck direct sowing once it warms up. A surprise frost comes late often enough that I usually wait until last week of May, meaning it’s quite a wait before blooms. I love Magellan because it is so beautiful in arrangements with cool colors (not quite pink) and warm colors (not quite salmon) while staying bright and vivid. For weddings, Polar Giant is my go-to. Do you recommend any that are mildew resistant? If you plant them in full sun, give them adequate spacing and water at the base, they should all be quite mildew resistant. I love zinnias. They are such a cheerful flower. So many fun varieties! Thank you. I adore zinnias! I’m in Albuquerque, NM and our extreme heat is difficult- out of packs of direct seeded zinnias last year, i got only one plant that grew and bloomed! This year I’m trying all seedings started from seeds indoors and will see how they do. It’s been very frustrating trying to grow something billed as an easy, beginner flower in this climate- I’m in my 5th decade of gardening, but new to this climate! Please explain what you mean by “grow them in fabric”. Thank you. Last year I had s really difficult time with my zinnias initially. I had problems with dampening off, and then decided to directly sow in the garden. This took 3 attempts. Normally I find them very easy to grow. Any suggestions? Thanks! I love zinnias! This makes me want to order some of every color! Ahhhh Thanks for all the great information on flower growing! I just watched my seeds pop up after only a few days of being sown. It was so gratifying after having some germination challenges with other starts. I wanted to hug those little guys! Choosing only a few varieties was almost excutiating but I want to grow a little of everything so I have to be choosy with my limited space. I ended up getting the queen lime, zinderella lilac and desert sunset mix. After reading this I want to grow fields of zinnias! Thank you Erin for such a credible overview of zinnias. Such a wonderful flower. Zinnias are my favorite cutting flower mainly because they are so easy to grow and they’re very prolific. The Queen Lime series are my favorites because their colors are so unusual. My youngest daughter(she’s 17) asked that I grow the flowers for her wedding, which I hope won’t be for quite a while! But I consider it quite an honor that she loves all of the flowers that I grow. Fantastic! And soooo beautiful! You’ve inspired me to try my hand at growing them! I have your “ Cut flower garden “ book and love it! I’m in Canada, not far from you, so should be able to follow your book easily. This will be my first year growing Zinnias. This will be my first year growing zinnia’s. I have 2 varieties that I have received from floret and I’m quite excited to see the colors of the Queen lime orange. I am hoping these mix well in arrangements with my DA roses. I have been really enjoying your blog and find it inspiring to grow all sorts of things that as of yet I haven’t. We love growing Zinnias here in South Florida. It is sometimes difficult to get the variety and color of flowers down here in the tropics, and zinnias help fill that void. I am excited to try this trick to get longer stemmed flowers. And to provide additional nutrients through weekly seaweed tea. We do have a major issue down here in the south with Powdery Mildew, its so humid it has become a never-ending battle. Perhaps with the additional seaweed tea nutrients and healthier plants, I can battle this a little better. Now just to keep the iguanas out of the flower beds (the eat everything to the ground and outsmart even chicken wire)… but another south Florida issue. I’m so glad you mentioned that Scabiosa varieties revert to single flowers under stress. Last year I was so excited to grow Zinderella Peach for the first time and was so disappointed with the results. Not only were they single flowers, but most of the flowers didn’t even have a complete circle of petals; many only had 4 to 6 odd petals per flower and were a washed out dirty white color on otherwise healthy plants. My other varieties of zinnias were beautiful, so I couldn’t figure out what the problem was. Here in Eastern Washington are summers are so hot, I think, sadly, I won’t try to grow this variety again. Thank you for that valuable bit of info. I have loved zinnias since I was a kid, thanks to my Dad. He was an incredible gardener, and every year would plant a row of zinnias and a row of marigolds at the edge of our vegetable garden. He’s been gone for 23 years and I have never grown a vegetable garden, but I grow zinnias every year. My favorite is Benary Giant, and I love to mix them with snapdragons. Thanks for this lovely article! 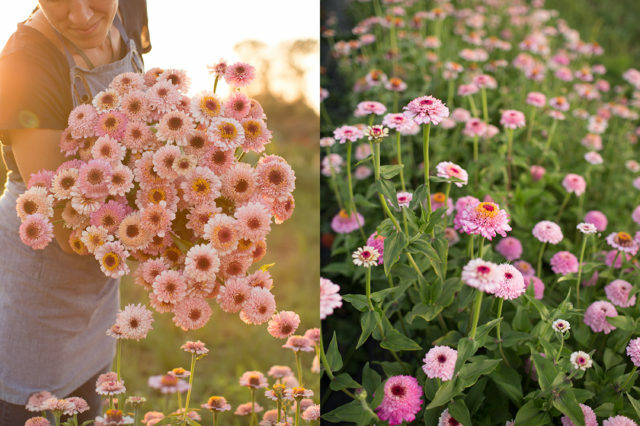 the photos of all those beautiful zinnias have me itching for Spring! I’m in Ohio, and am anxiously awaiting the time I can dig in the dirt! Great article. We have been growing and selling them for a year now in Florida. Was the only nutrients for the growth period added during bed prep and during seedlings when you used compost tea? What kind of spray treatments do you do? We have quite a powdery mildew problem during the dry winter month (we grow year around). Do you have to deal with that? I love all of the information on zinnias. 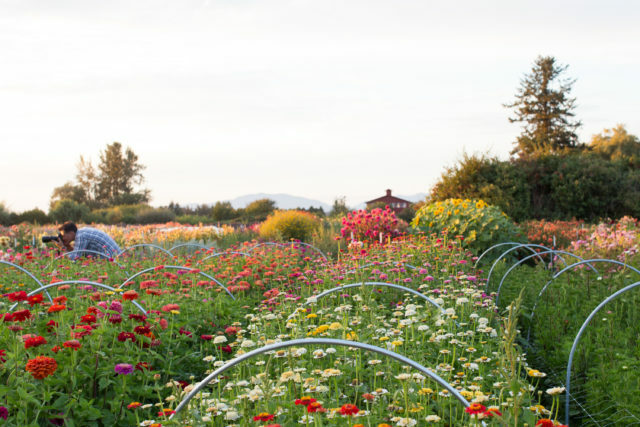 The rows and rows of zinnias look gorgeous. I grow a lot of zinnias during the growing season. Sometimes when a perennnial is done blooming for the season in spring I will throw in a pack of zinnias for color the rest of the summer and have had a lot of success with that. I forwarded your site onto my daughter in law and she was so inspired she asked for and received from me your book for Christmas. I can’t wait to see what she grows this year. I am in zone 5b, Wisconsin. Zinnias are a favorite of mine and I plant them every year. We recently moved to a house with a smaller yard and so I have less space to plant in. I will definitely be using the pinching technique to encourage more blooms. I’d love to try the Oklahoma series, as that’s where I live. :) Maybe next year! Love the information on zinnias, Erin. I have been growing State Fair Zinnias for a few years, and they are stunning, multiple pinks, deep rose, yellow and a few white. So stunning and the sizes ranger from 2″ to nearly 4″ wide. I am in love with these, along with the dwarf series, Profusion Coral Pink, Fire, and Orange. I’m soo enjoying all the Zinnia talk . I’m obsessed with them . The flowers change form so much as they mature and stages are fascinating . The bees and butterflies love them . I grow them in Mogo . New South Wales . Australia . They are fabulously easy to make stunning cut flower bunches . I take them to my Mogo Nursery , people love them . Thanks for your info . I found the reverting to single flowers interesting too . Zinnias are not only beautiful, they are so important for pollinators and butterflies. Yours are so gorgeous! I live in Miami Florida and that means we are a unique micro climate with a 10B hardiness zone rating. Sadly this means I can’t grow most anything from my native NW. Do any of your zinnias do ok in 10B? hanks for the tips about scabiosa varieties! I’m going to pass that info on! Just loved this article and the photos. The zinnia is the grand old lady of the garden to me. Have always included them as such happy vibrant and easy to care for plants. Flowers last a long time as a cut flower too. Great article, thank you. As zinnias are considered prolific bloomers does that mean you can cut stems every week when conditions are good? I am so curious as to how one shall harvest flowers that grow in netting? Do you cut it under the net and pull it up through? 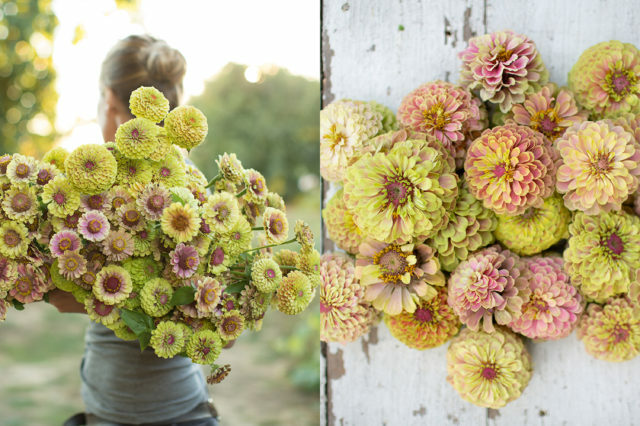 Thank you for the article on zinnias, i have fallen in love with all the new colors an sizes. Looking forward to being as successful as you have been in growing them this year. Is there any way to combat or remedy for powdery mildew? I always seem to have this around the end of summer beginning of fall all my zinnias get PM. I ordered your ‘Cut Flower Garden’ book and LOVE it! I’m hoping to grow the table flowers for my son’s September wedding. I’ve always grown a few flowers, but not for a special occasion. 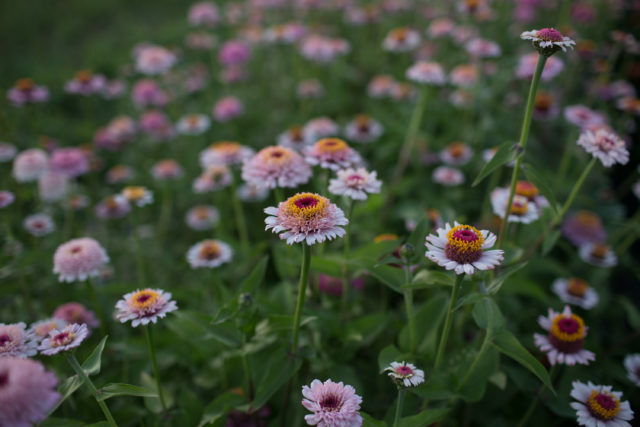 Living in the Flint Hills of Kansas, we knew zinnias would be top of the list, as we tend to have very hot windy summers. 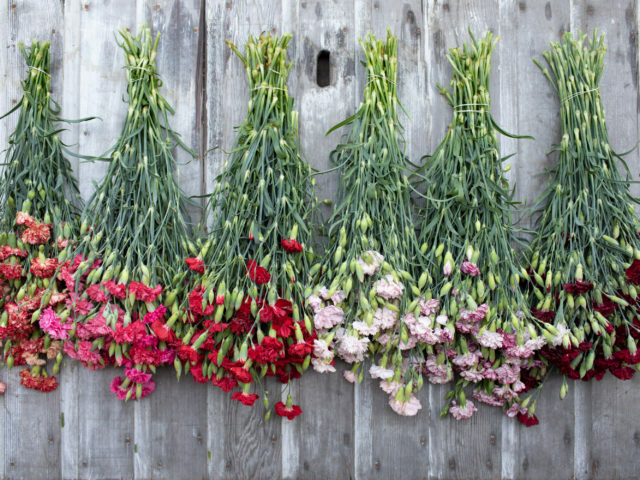 I had no idea there were so many beautiful varieties until reading your blog and looking through your book. I’m looking forward to reading all the tips because I know I’m going to need help! Thanks so much for writing such a beautiful, helpful book! It is absolutely pouring here in the UK so this article was a magic pick me up. I have sent it to a sick friend who loves her garden. Roll on summer and thank you for all the advice. Zinnias have been in the family garden every year since before my dad was born. There are multiple pictures of my grandmother’s garden bursting with zinnias from back in the day, and my father has been growing from saved seed for years now. They have the coolest antique cream colored single petaled cactus flowered variety that pops up every year. ( I’m going to try to save from it this year. (I cut them all this year.. oops) I named my daughter Zinnia Raine in memory of my late grandmother and we grow tons every year! I’m especially excited to try the zinderella series and the queen lime blush this year ! I love Zinnias. We had a hot summer (for us) last year and the Zinnias loved it. The Queen and Bennary series have been brilliant. I am growing the Zindarellas this year for the first time and I can’t wait! Thank you for this really thorough exploration of varieties on offer! Zinnias are one of the flower types we grow the most of each summer. They are extremely easy to grow. We direct sow a few times through the summer, but just one planting provides us with blooms for many weeks. Definitely a must-grow! I used to be a huge zinnia snob, feeling like they were second class to dahlias, but now I’m a total convert. I have too many seed variety for my garden space, so I’m trying to convince my husband to let me dig up some of our existing landscaping; we’ll see how that goes. Anyways, this year I’m really excited to grow a few new (to me) varieties I bought from a different seed company: Uproar Rose and Art Deco. Thanks for the tips about scabiosa varieties! I’m going to pass that info on! I am so glad to have read this article! Zinnias have been a major part of my cutting garden for years and they are one of my favorite things to grow. I love the look of the scabiosa zinnias but haven’t had as much success with them as I would like, it’s good to know that it’s stress that’s causing the single blooms! I’ll be a little more careful with those this year :) Thanks for all the amazing blog posts!